It’s strange how some things that shouldn’t hit hard do, and others that should don’t appear to. Maybe it’s a matter of expectations or how much reserve strength you have. Sometimes you just can’t really figure out why you react in a particular way. I didn’t cry when the house burned. On the drive home I got a little lump in my throat that wound up in a tingle at my jaws and the impulse started. The tears welled up a little, but they didn’t actually form. My experience in the Cobb County tax office wasn’t like that. When it was over I was stunned, and I wasn’t wondering at all why. I waited two months to write this article because I didn’t want to say what I would have said if I had written it when it was fresh, and I’ve waited even longer to edit and publish it. The house burned just over two weeks before my property taxes were due. I couldn’t remember if it was billed in advance or arrears and didn’t know the effect of a total loss on the evaluation, so I dropped by promptly to get a new, accurate bill and pay it. The first trip wasn’t too disturbing. They directed me to the assessor’s office and a tall slim man with a kind demeanor came out to talk to me at a low counter. He was really proud that someone had noticed the front-page article about my house and the file had already been updated to show my loss. He was very sympathetic about it. I told him I appreciated that, but needed to stay in functional mode. He caught my meaning and then he stuck only to facts. The value I would pay taxes on was not prorated in any way for the loss. It was based on the valuation of my property on the previous January 1st. I was checking because I hoped for something more reflective of the situation, but expected exactly the answer I got, so I moved on to the next thing. He said “Oh, I’m not sure…just a minute”, went away for a few minutes and came back with a bill. I asked if that area I had passed around the corner was the right place to go. Then he said something I knew I shouldn’t have listened to. He told me I didn’t need to worry about paying it then, I could just stick it in the mail by the 15th. He was trying to be nice, but I regret taking his advice. I had the check in an envelope days ahead of the due date, but couldn’t remember where I had put the new stamps. The hotel room was disorganized. Then I wasn’t near a post office when I was thinking about it. The whole thing had been demoted on my mental checklist because I had partially taken care of what needed to be done and also because other things came to the forefront. On the due date I was exhausted from having to think about so many different things that were no longer static in my life. I had reached the point of being overwhelmed and realized that I wasn’t driving well. I had, in fact, just driven in circles thinking about different things at different intersections when I remembered the bill and realized the post office had closed. It was a half hour drive to the after hours post office where I could get the golden postmark, but I needed to get out from behind the wheel or there might be more insurance claims for me to deal with, or worse. I mistakenly thought there must be some small period of grace and opted for the safer choice. That turned out to be a painful overestimation of reasonableness. The penalty bill was sent so fast that I wondered how it was even possible. I couldn’t figure out why it looked like I had under paid the bill, but I didn’t spend too much time studying it and I wasn’t in a huge hurry to stop by again to request that they forgive the penalty. I expected they would. The payment had been mailed a mere 8 hours after the required postmark and the mitigating factors were understandable. Had I figured out that they paid the penalty with funds I directed toward a tax payment and shorted my actual tax payment by the amount of the penalty, I would have also realized the implications of a policy like that and I might have at least have had some inkling of what I was about to experience. I went back to the tax office and explained my abbreviated story to the clerk in the payment window and asked if the penalty could be forgiven. She started quietly repeating every trite absolution from responsibility that exists. She started with “Just doing my job” went through “The computer system won’t allow it.” and kept right on going, but part of what disturbed me was the thinly veiled power rush that lit her eyes. She told me some people had paid several times as much in penalties. Then totally confused me when she said “Just pay the 20 dollars.” That was much less than the penalty and not evenly divisible into it either. “Well you’re asking for hardship aren’t you? Make payments.” (something I can only see as an opportunity to pay an interest rate that resembles usury accompanied by multiple additional opportunities to repeat missing a postmark by a whisper and earn additional unreasonable penalties). “No, I’m not asking for payments. I can pay my bills. I’m asking not to be charged $150 for being eight hours late to the post office.” I was asking for humanity. I had my checkbook out and had started to write several times, but stopped because she kept on. She seemed to be taunting me. It was the set of her jaw, the line of her brow and the fire in her eyes. I kept stopping to look at her. She said “It’s not like I get to keep the money.” Why would she keep going while I was actually writing out the payment? Why would she spontaneously deny a bizarre misconception? I asked to speak to her manager. “Oh, you want to take it there? We can take it there.” Nodding a challenge at me. How was it that she felt challenged by someone who had both hands busy writing a check? I was shown to a small room with a partial glass wall. The clerk spent more time prepping the manager to see me than I had spent speaking with her in the first place. The manager came in. I told her briefly why I had asked to speak to her, she said to me “Well I’m sorry you FELT it that way.” She talked about how “unlike her” it was to do anything inappropriate and asked me if I would like for the clerk to apologize to me. I declined. The manager explained to me that the penalty could not be forgiven because “I had already paid it”. The tax commissioner’s policy is to pay the penalty with funds that I had actually directed to pay my tax bill. What I actually still owed, she said, was taxes in arrears. I wasn’t sure that was even legal. The full implication of what it meant affected my breathing. Unpaid taxes make me subject to streamlined, non-judicial foreclosure. The distinction was a matter of choices and technicalities that were very deliberately policy (and still reversible, as all policy is in a democracy). The likelihood that mail delivery might be sketchy when the house behind the mailbox had become a charred shell of molding remains increases the odds of delivery issues, mail tampering or any number of other ways I might fail to receive a bill that I never expected. There was no compassion or even reasonable care to the situation that the Cobb Assesors office had put me in. I was a mere missed letter away from being blindsided by a non-judicial foreclosure on everything I had left. When I told her that I had made responsible effort to acquire and pay the bill under difficult conditions she asked me why I hadn’t paid the bill when I received it. I told her it was not my habit to pay bills months in advance and I couldn’t know that my house would burn down. She made it seem like everyone should know that their house could burn down and they should, in fact, pay months early. It never occurred to me to even mention the employee who had encouraged me to put off the payment at a much later point, much less blame him. I was now crying in public. I felt helpless, at risk from a government that was supposed to protect the public good and at that moment I wanted out of Cobb County. Badly and Forever. I don’t mind paying for the public schools that brought me to the home I chose by school district, the infrastructure that brings new business or any number of things I have no choice about. And I paid my taxes. But knowing that they deliberately set things up in a way that would foreclose on what remains of my property for an eight-hour delay was the most defeating thing that I have felt in some time. Consider this. Maybe I was too emotional to remember or report my visit to the tax office accurately. I was stressed. It’s possible. Maybe that manager wasn’t using a particularly vile form of condescension combined with bullying when she suggested that I should have paid my bill months before it was due. Maybe I “felt” the behavior of that clerk who seemed to get perverse pleasure in the pretense of power that went with her bottom rung position as something other than what it actually was. I did after all actually break down in tears in the office, wait months before attempting to write about it, and actually cry again when I did write. The thing I’m definitely not wrong about is that when my payment was postmarked on the 16th instead of the 15th, they immediately charged a penalty that they deducted from my tax payment and told me that I had unpaid taxes. Not even a loss of most of the value I was paying taxes on, or duress, made any difference. I’m glad my insurance adjuster told me not to put in a change of address until some other important mail had come. She said it sometimes causes things to get lost or delayed. I’m glad the USPS continued to deliver to mailbox that clearly had no residents. I’m glad that no one took my mail in my absence and I’m glad that I didn’t wait any longer than I did to go ask for what I thought was somewhere between common courtesy and human decency, because if any of those things hadn’t happened, the tax office would have advertised in a paper I had no reason to monitor about a debt I wouldn’t have known I owed to take property I didn’t know was at risk over a tax bill that was paid in full after an eight hour delay. Of course, there is a redemption period. IF I had found out during the time period when remedy is allowed, I could get my property back, by paying more fees, penalties, special assessments, their advertising costs and a percentage interest. I wonder just how many more tax office employees I would encounter, what the eventual penalties and fees could add up to and how long it all might take… if I even found out that it had happened within the time period under which I am allowed remedy. And, the reason all of this would have happened would be because I had a really rotten couple of weeks, listened to a government employee, became exhausted and didn’t judge myself safe to drive on one particular night and overestimated my government. Policies are changeable though. I hope that this one comes to be seen for the excessive harshness that it represents and gets amended. Replicate, Replace or Rebuild ? After the twin towers came down, they didn’t try to replicate what had been before. It wasn’t appropriate, practical, fitting or even possible to put things back exactly as they had been. Yet when one takes out an insurance policy, that is the focus, to replace everything, to put things back precisely without change or loss. Marketing departments sell the idea that you could and should replicate what you had before because it’s comforting to believe it possible. Because the damaged brick walls of my house could collapse without warning, it was dangerous to enter the ruins after the fire. I won’t likely ever know if there were more salvageable things than the few we have. I value my life. At the same time, I wasn’t really so sure that everyone else saw things the same way and was never completely sure that other people didn’t go in. With this in mind, I was in the thrift store nearest my house maybe two months after the fire and I was literally stunned by something I saw there. 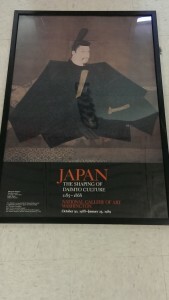 Before the fire, I had a poster from a castle in Japan. I bought it for the equivalent of three dollars, then hand carried it on both of the planes that brought me home. Uncharacteristically, I spent 100 dollars (even with a half price coupon) putting it in the perfect matte black frame with just the right raised gold design running through the middle. The frame really made it pop, so it was displayed in the family room and I enjoyed it immensely. There in the thrift store was my poster. I noticed right away that the tone was a little darker and my immediate thought was smoke damage. I grabbed the poster and dropped my jaw. I stared into it and tried to imagine what smoke might have done and whether or not this could actually, in fact, be my poster. I was staring so deeply into the tones of the poster that it took me several seconds, maybe even a full minute, to realize that I could read the poster. The words on the poster were Romanji (English letters to be specific) not Kanji characters. 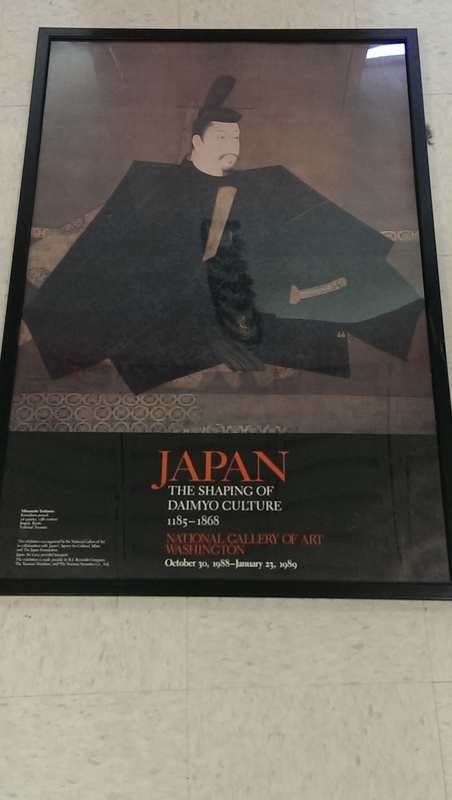 This poster had been from a traveling exhibit that was in The National Gallery of Art in D. C. several years earlier than when mine had been printed and it was in a cheap plastic frame with a plastic protective sheet instead of the glass with sunscreen that was on my own, something else I should have noticed sooner. And this poster had the writing on a separate black space rather than on top of the artwork. There were really a lot of differences I should have seen instantly, but the surprise of seeing such an unexpected and unusual one of the items I had collected over the years had its effect. I shared my experience with a stranger there. I couldn’t tell if she was interested. After settling down, I needed to decide whether or not to buy it as an addition to the piles of things I’m accumulating for the home I seek. I called Russ and asked him to recall the poster and if he liked it. Did he want to see its equivalent around again. It was $8. He said “Well, we like Japanese things. I’m sure we’re going to have them again. I’d say it’s your call.” It was a nice and generous response, but not effective in moving a decision forward. I cloistered it in my cart and mulled while continued to shop. I knew that I would want to re-frame this poster because the frame added so much appeal to the other one. Eventually I photographed it and put it back. It would be half price the next day and I’d be driving by. As silly as it sounds to wait for half price when the frame would be so much pricier than its subject, that’s what I decided. It put an element of fate into things. As I was checking out, the lady with whom I had shared my story couldn’t believe I had not decided to buy it and I almost walked back to get it. The next day I forgot to check until late in the day. It was gone and I wasn’t disappointed. I guess it was the right decision. 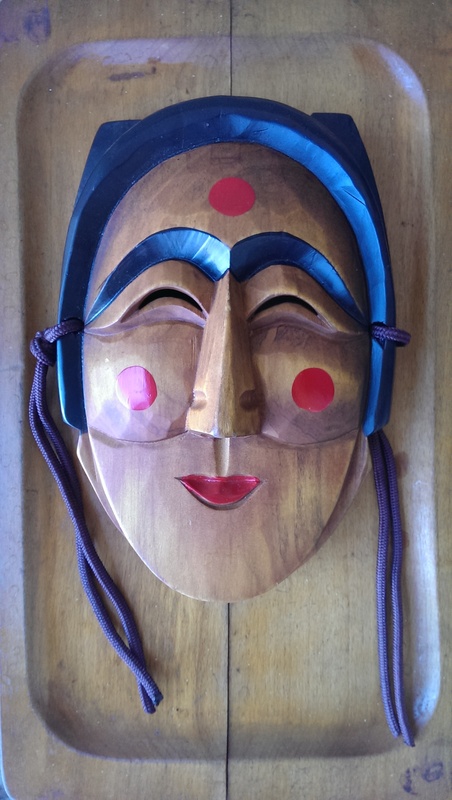 Last night I found a beautiful carved wood mask in a thrift store. I thought it was Japanese. It was similar to so many that I had seen while I was in Japan. I had shopped through several tourist spots intending to buy one, but they were fairly expensive and I never settled on the right one. Or, more exactly, once I knew which one was the right one for me, I wasn’t at that temple any more and I wasn’t able to go back. This mask was above the range of what I normally spend for something like it as a thrift store purchase, but it was still significantly less than I would have paid in Japan. It was also much less than I would have paid to frame the poster that I didn’t choose to replace. I’ve accumulated a few masks since the fire and some of them are impressive. As it turns out my new mask is a Korean Hahoe mask. I hope that my new home has a good place for an eclectic collection of wall masks from places I’ve been and from places I’d like to go. I have a bit of a vision of what it might look like. I think I will like it. That’s not exactly how the Bard wrote about King Richard III’s battleground predicament, but I’m feeling a bit of the same dilemma. Trying to find a home has certainly marked a winter of discontent (and rare winter storms). One of Shakespeare’s most misunderstood plays about one of the most controversial English regents seems a good thing to parody while I’m trying hard not to take myself or my situation too seriously. Normally the decision to move comes at a natural break, a change in life or career that makes moving away or changing your home the natural thing to do. Mine came quietly in the wee hours of the morning with the sound of fire fighters who scarcely woke the neighbors while keeping the fire from spreading to their homes. My guiding change was only abrupt need. A rush of decisions hit. First there’s triage, then there are bigger decisions. The decision about temporary housing had to be made before the long-term decisions. Conveniently staying near a major junction in interstates had advantages, but wasn’t convenient to the place I eventually decided was most important to find a home and, what turned out to be my primary goal and focus wasn’t anything I had even thought about before the fire. I knew that it would be hard to make decisions about small stuff before I made decisions about the big stuff, yet life moves on and the small decisions happen whether or not the big ones do. I’m not so far from that time when many people downsize, and let’s face it. When you have just lost the house full of things you spent a lifetime collecting and inheriting, that does seem like a time to downsize. But I haven’t quite made the time when I can do that. My home needs to accommodate all the needs it currently fills. So, the house that fits this year, may not be the house I still want to keep in 3-5 years. I thought I really wanted a short sale or a foreclosure. The savings would help me to make up for the likelihood that I would be in the house for a short time and cancel out some of the extra expenses of a short-term ownership. It’s a game for the big boys though. I’m looking for a home in Fulton County where those foreclosure auctions on the courthouse steps include the high value homes of Atlanta and its surrounds. Here, even a home that goes for pennies on the dollar can have way too many decimal places for me and even on the homes that do apply to me, the ruthless people who know what they are doing are competing for a decreasing commodity and they could swat me away with their little fingers. My sweet spot would be getting a house that someone else got on the courthouse steps, but hadn’t remodeled yet. Something that still had room in the price for me to improve it and have a little reward for my work. I went to a meeting for investors who wholesale properties. I thought I might find someone who had a property for me. I wasn’t really comfortable there. There is a kind of respect that people are due and I couldn’t see it at this meeting. It is true that people have to look out for themselves and their families. How one chooses to do that comes in every color, shape and size. I know a sales person who said “I looked at every sale that another man made as taking food from the mouths of my family.” He was successful, but in spite of how that sounds, he was also compassionate. People find their own ways to keep up the march and it is a struggle. Some people have appetites that are never sated though. They lack appropriate respect for the resources they use. Some would take anything they can get and try to force a situation to squeeze out even more from people who are desperate and powerless. Do they need the win, the extreme TV or the power vacation? It’s about how ever they define superiority and superiority is not the hole I’m looking to fill. The truth is that foreclosures are not distressed properties. They are the properties of distressed people and the choice to focus on the inanimate is just a means to help distance humanity. I want the good deal that helps to make up for some of my losses, both in the fire and in the future, but I want it to come from one of those careless people who doesn’t try and brought their trouble on themselves. I want it to come from the person who will never have anything because they go through life irresponsibly. I don’t want it to come from someone who lost their job through no fault of their own, or worse, lost their health. But I won’t get to choose and I may not know until their neighbors become mine. As much as I would like to take care of my own family in the best way possible, to find the best deal, to continue my march and fill our needs, I do understand that what I have been looking for could be heart wrenching if it actually comes my way and the search for any home at market or below continues as I weigh the prices and potential of what is available. The housing market has changed since I was last paying attention. I’m seeing that trusted resources like Clark Howard recommend renting in the current market if you will be in a house for fewer than 10 years. I don’t like throwing money away on rent, but I’m not happy with my current options and I’m not expecting appreciation to make much headway over the short-term. If money is to be lost, loosing it without the additional risk of short-term market swings could be the lesser evil. Many of the houses that I can purchase have serious condition issues and the prices don’t seem to reflect that. I’ve drifted toward looking at homes that are far outside my budget to be ready if they become short sales, and kicked myself for missing it when a couple of them did. But, there’s no good way to know and my missing it was not through lack of effort. This has been a winter of discontent, searching and storms, yet, I have still spent much of it grateful for the better than good bits and I continue to trudge through those other bits with faith that something will turn up. One never knows what the day will bring when setting out in search of treasure. Many people look at fishing as a similar venture. My father was an extraordinary fisherman. People who went at it with less seriousness saw him as lucky, but I knew better. He had put in the time and effort to take luck out of the equation. When he was young he kept meticulous notebooks recording places time, weather, water quality, bait/lures and other things, and for the rest of his life he did mental editing. He knew when, where, with which tools and under what conditions the fish would bite. Like the younger brother who was described in “A River Runs Through It” my father on the other end of a fishing rod was an artist. He got there with practice, attention and perseverance. In thrifting it’s the careful attention and plodding perseverance that are most useful. I’d like to think my good results can somehow be attributed to skill, and it is important to know your stuff, but a lot of it is just putting in the time. Some stores will have habits and knowing them is useful. But, they don’t always stick to their own habits, and they are dependent on sometimes unpredictable things, so going back again and again is the only way. It also works in their interest to make sure you have to set foot in the door, to be in impulse purchase mode, to find out if they have the thing you really want. We who love to thrift are particularly susceptible to impulse purchases. That’s how some of us become hoarders, and how others of us end up donating our purchases back to the place where we bought them to be resold again. Wednesday, I made a big loop. It was about 15 stores, a tank of gas, a whole day and two meals out. So, maybe $300.00, nine hours and 100 or so miles were what it took to bring in my treasures of the day. Handmade Oak Craftsman floor lamp, needed a harp and a finial. Retails at $435 The harp and final requires a trip to a lamp store for a sturdy harp and a finial worthy of its lamp. That was an extra 2 hours and $20.00 cost added to acquisition. I gave the lamp to Russ for his Valentine’s present. A Paula Deen ceramic tube pan retails for $40. A handmade lazy Susan that the maker still sells for $70 needed a bit of steel wool and some new oil, or $5 more dollars and 30 min. So, I had a very good day. I built my household, my Etsy business and my local business, The gain was around $500, but there’s always a but. Only around $150 is in salable merchandise and there will be percentages as well as overhead (like booth rent) taken from that. Most of today’s finds will go toward the “How much of our household can we replace through thrifting” part of the equation. We got a really nice floor lamp that retails for about 4 times what we would have paid if we were buying a new household item and it was the showcase item of the day. I’m very happy with it and Russ is too. However, it is important to note that a large part of my gain comes from attributing retail value to that lamp, rather than valuing it at what I could ask for it if I were to sell it second hand. Much of my gain for the day is in having something nicer in my home than I could otherwise afford to buy. Another big part of my success lies in the fact that I had several goals. That allows me to find more things that fit. If you’re looking for 20 different kinds of things it is more likely that you’ll find one of them when you go out. Photos of some things will follow, but it’s time to publish, my technology is not playing nice today and I have appointments to keep.